One of the questions I get asked by small business owners most often is this one: “How can I find the media contacts for XYZ?” Fill those last three letters in with any magazine, blog, or television show and you’ll basically be writing the emails sent to me on a weekly basis. That’s why I decided to answer you all, right here on the blog where you can access these action steps anytime to find media contacts without buying them online. In fact, why don’t you print this handy list of strategies out, or bookmark this page, so that the next time you’re stumped while trying to connect with a member of the press, you can bust out one one of these strategies from your PR toolbox. It’s essential that you do not confuse media contacts with media relationships. You simply cannot have one without the other. Having media contacts without working on building a strategic and authentic media relationship is like having a car but no gas to put in it! You’re not going to go anywhere fast and moving is going to take a lot of energy! Sure, you could buy contacts, or have a friend forward them to you, but my dear reader that’s not even half the battle, and it’s not the way to get you the long term publicity your business needs to thrive. So while it’s vital that you’re able to track down their contact information, and sure, if you want to save time and energy and purchase a list, you MUST also make the time to turn those names and email addresses into people you invest time into getting to know and connect with, beyond the pitch. Are we we clear? No pitching the press without investing time into the relationship a bit first. Speaking of, Strategy #1 will help you do just that…. One of the shared habits of people who get consistent publicity (whether they be a small biz owner or a PR pro) is making and taking the time to research, study, and consume the content in the magazines, blogs, newspapers, and TV shows that they want their business to appear in – they know they should be there because they know the media outlet. And I don’t mean they know it like they know its name and that it covers “topics for women” (nice try, my friend, too broad), I mean they know specifically what type of content they give to their audience, who the audience is, who works at the outlet and which of the people working there cover their type of business – because they’ll actually see it first hand- and they know how the outlet and these people cover their industry, product, service, or story angle. Doing your research should be your first stop on the contact hunting journey! Not only are you going to get to know who covers what at the media outlet you dream of appearing in, but you’ll also get some valuable information and inspiration about the place magazine or TV show you’re pitching from tone and style to story ideas. A good media researcher knows the style, tone, and layout (whether in print, online, or on television) of their media target’s content. They know they’re a good fit, they know who what part of the show, magazine, or blog they’re a good fit for, and they most likely know who at that outlet covers this specific section because they’re reading it, watching or listening to it. You can’t help but get to know the people who cover the content you want to be in if you actually begin to pay attention to it – it’s that simple! When you actually become an active follower of the media outlets you want to be in, you’ll begin to see patterns in how they deliver their stories and coverage, and this will help you deliver information about you and your business to them in the best way possible! You’ll know how to fit yourself into their work! In many situations (especially in the case of blogs and newspapers) you may even score the contact information listed while you’re doing your research. The press aren’t hiding for you. They are happy for the right kind of stories to find them! One final reason you want to do your research this way? It’s going to let you see what your contacts have been covering before you reach out to them, and this saves you from pitching them a story they JUST covered. Pitching a story that is too similar to one that was just covered is not a good look, it’s like showing up to a black tie event dressed exactly the same as someone else: It’s not a good look. Okay, let’s get started: If you flip to through the front few pages of the magazine, you’ll stumble upon a list of names (it will look like THIS) going down the page, with their positions listed above or to the side of them. You’ll see some names with job titles like “editorial assistant” (keep your eye on that one for later) all the way up to editorial directors and the Editor-in-Chief. You may see another set of names with marketing/advertising contacts, you don’t need these for your PR outreach so ignore those for now. Most magazines are divided into sections by industry/beat as well, so you’ll see sections for Beauty, Fashion, Start Ups, Feature Stories, Financial, and forth, depending on the magazine you’re reading. This is a very useful place to begin getting to know who covers what at the magazines you want to write about you. You’ll actually see who covers your industry, and then as you flip through the magazine (doing consistent research like you agreed to do in Strategy #1) you’ll be able to begin associating the names you’re learning with the articles they’re writing. Press for Success Pro Tip: As you get to know who specifically covers your industry at different magazines, start to follow them on Twitter/Instagram so you can get to know them and their personalities better. Then, as you do this, can you can begin to connect with them authentically and strategically on these social platforms. Building a relationship this way before “cold pitching” them will increase your chances of getting a response and pitching them in a more personalized and customized way! Remember how I told you to keep track of those editorial assistants – and more or less anyone with an assistant in their job title – we’ll be talking about them next, because it’s time for Strategy #3! Do you know what will save you time, stress, and agony from waiting for a response to your pitch – as well as the time spent wondering if your pitch reached the correct person in the first place? Ask. Ask and you shall receive! Closed mouths don’t get fed! If you picture a magazine, blog, or TV show as a fortress you’re trying to break into (in the most positive, meant-to-be-there sort of way) the Gatekeepers are the people who are going to help you get access to that fortress, they’re going to see you knocking at those gates, open them up, and point you down the path to the best person to connect with for your story and business. This could be an editorial assistant OR an assistant in the specific department (fashion assistant, beauty assistant, health assistant) that correlates with your industry. When trying to reach out to a TV news channel with no direct contacts to email or call, you’ll often be addressing the assignment desk or main news desk first, and whoever answers the phone will act as your gatekeeper. These are the people you can reach out to via phone or email, briefly explain who you are/what your business is, and who specifically you’re hoping to connect with, and they can help you be sure that you’re headed in the right direction in terms of WHO you’re pitching at their magazine or in some cases, news program. Sometimes you’ll be asking them who best at their magazine/TV show to share your story with, other times you may have an idea of who you want to reach out but you’ll confirm this with the Gatekeeper, and perhaps get their direct contact information from them. It’s your job to be as specific as you can about who you’re trying to reach, whether by job title/department/story angle or by identifying them, as that will help you get connected to the right match for your pitch and your story. What does this outreach to a Gatekeeper look like? Email the Gatekeeper, clearly state who you are and what your business does – briefly – and include a link to your website. Be very specific about what your “ask” is, in other words, are you hoping for coverage in the Look for Less section, are you pitching your tips for their Health List sidebar? Be clear that you’re looking for the best person at the magazine to connect with for a specific section or about a specific story angle, help them help you! Don’t send them an entire pitch about your business, again, you’re writing to ask for more information not to pitch them your story. Once they let you know who you should be connecting with, thank the Gatekeeper, and log their information and the media contact they recommend to your in a Media Outreach Tracking Sheet. (Need one? Become a Press for Success Masterclass student and download it – and all the other PR templates you need – today). After logging all contact information, you can now reach out to and pitch the contact your Gatekeeper referred you to, and in this email (both subject and body if you’d like) you can include “Referred to you by [Gatekeeper’s Name Here]” which allows you to show that you in fact did your research and that someone they know, trust, and work with has referred you to them. Once you’ve done this, again, log your pitch – can you tell I’m a big fan of tracking your work? Extra help: Would you like full pitch scripts you can use to reach out to the Gatekeepers and pitch your media contacts? Get over 10 of them by becoming a student of Press for Success, my online, self-guided PR Masterclass for Entrepreneurs and Experts! Most large television networks and publishing houses (think Hearst, Conde Nast, Time Inc., etc) use the same email formulas for their staff, just like you probably do at your own office. This means, simply plugging in the correct name of the media person you’re trying to reach out into this email formula to you will give you their email address. Want the actual email formulas and other examples of this strategy? 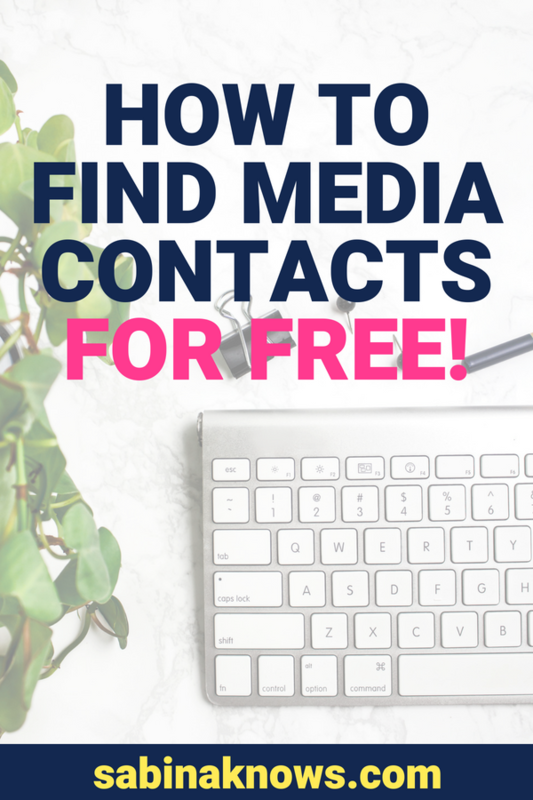 Get them for immediately and FOR FREE via my (also free) training: How to Find Media Contacts for Free. Dive into it right away, here! BUT WAIT! Before you go on an email bender with your brand, spanking new formulas, remember that a first impression is an important impression and you want to hold off on pitching until you’re sure you’re reaching out to the right media contact, that your story is a good fit for them, and you’re equipped with a well-written pitch. That said, using these formulas, and doing your research to figure out the rest of them that you need, will help you decipher a large portion of the contact details of the editors, reporters, and producers who you can provide value to with your story, product, or expertise! Want some help creating wow-worthy ideas for the pitches you’re actually going to send these editors and producers? Use the proven-successful story ideas in this FREE E-book to get you going! These ideas have resulted in publicity for countless business owners and experts of all kinds dive into them today! Go to Twitter.com and focus your attention on the Search box in the upper right hand corner. Let’s first try searching by Outlet. Type the name of Oprah Magazine (or, simply Oprah Magazine) – a magazine many of you are hoping to share your business or expertise with – into the Search box and press return/enter. Now here’s the part where you have to be careful. Don’t click on the name of the magazine when Twitter starts to give you auto-fill options, or it will take you to that magazine’s actual Twitter profile and that’s not what we’re trying to do here. Once you correctly enter the name of your target magazine and press return/enter, you’ll be taken to a page that showcases all the different ways Twitter can display information and content about this magazine. Within those options is a menu bar that includes the choice “Accounts”. This is what we’re going after! That’s your pathway to a list of accounts associated with O, the Oprah Magazine (and in the future, any other media outlet you try this strategy with) and that is where you’ll be able to do some specific Twitter searching and connect with several people who work for the magazine. From the Editor-in-Chief to the health editor, the photography department to brand show have been featured in the magazine, Twitter will display specific accounts that will be valuable to you in your Twitter research. You can also search this way by job title. Let’s say you’re looking for accessories editors to pitch your products to. Start again from the Search box on the Twitter homepage and type in “accessories editor” into the search box and press return/enter. Once you get to this search results page, narrow your search down by Accounts in the menu bar. Kablam! Welcome to a page packed with the accounts of accessories editors from magazines and websites that you may want to add it your Media Tracking Sheet and PR plans! Once again, just like with any media contact research, it’s important to begin following and getting to know your media targets on social media prior to pitching them, so as you find good matches for your story, product, or expertise, follow them on social media as you log their information in your tracking sheet. You can watch me demonstrate this live, on-camera, in Press for Success! Now You’re Armed (with Strategies) and Dangerous(ly Ready to Reach Out)! Doesn’t it feel good to have strategies like that at your fingertips? Doesn’t it feel empowering? It is! When you know how to find media contacts, and better yet, when you begin to focus on building relationships with press in addition to building your media list, you open yourself up to unlimited opportunities to share your business, your expertise, and yourself with the press and the world! What strategies do YOU use when you’re looking for the best media contacts for your story? Share them with me below, I’d love to hear what’s working for you!